On the left is part one and on the right is part 2. There are 4 parts total, three thimbles with different stitches and an original design or one she gives us which is a bit larger and we need to use what we learned in parts 1 - 3 to stitch it. No numbering is provided! More details in a previous post. 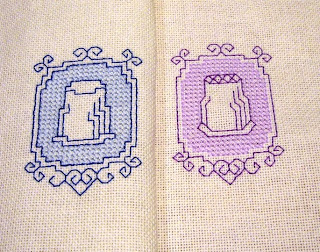 The main difference between the two is the purple has angles for parts of the thimble, along with a design in the thimble top, and I used the light color to outline the filling cross stitches. On the blue you can see that I used dark blue for this part. I am working on part three and have the thimble done, but now doing a doodle cloth to figure out how to do the filling stitch - the N stitch - and have it be reversible. 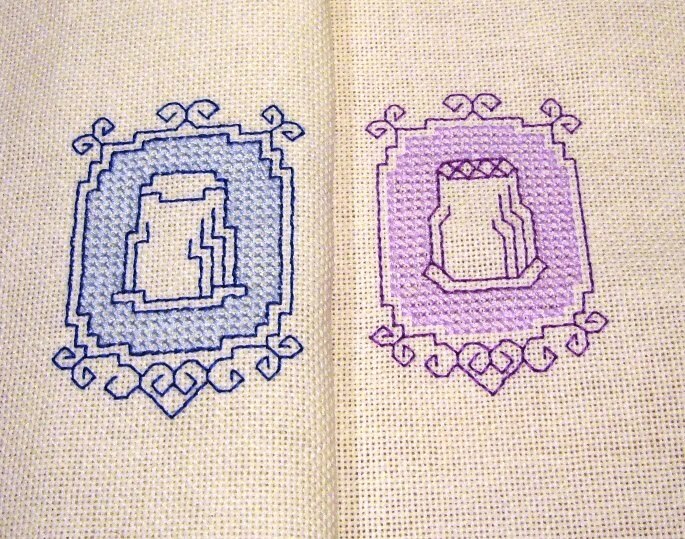 The filling, whether they are cross stitch, N stitch or even long armed cross, are a bit tricky in the areas that increase or decrease in size if you want the back to look correct. Part three is in greens and I hope to have a picture of is soon! !